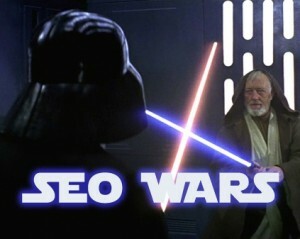 Home/These Aren’t The SERPs You’re Looking For.. Speaking personally, SEO implemented the white hat way gives you a great deal of satisfaction. And with a negative side to SEO also present, it almost echoes the old diametrics of good versus evil, right versus wrong, or if you’re a product of the Star Wars generation, the light side versus the dark side. Doing it right, is the only way, for me at least. Does white hat SEO still give you the results you want? To me that can only be answered with a yes AND a no. White hat SEO provides tangible results – everyone knows this, but those who engage in white hat techniques are still fighting a losing battle. The “dark side” of SEO still seems to be ultimately more powerful – for now, at least – and it’s just not right that those that adopt a pure, white hat strategy (which amounts to months of work) can still be leapfrogged by a five-minute black hat campaign. So as the Hummingbird dust settles with great promises that just one way – the RIGHT way – would be the future of SEO, why is that a question that’s starting to appear more frequently in SEO circles of late? The answer of course is simple, and one that’s existed since Google Search was developed in 1997. Loopholes and exploits still exist, and they’re as easy to find as ever. What’s more, and infinitely more frustrating is that Google is telling you otherwise. Things have improved in some ways, but today for some reason the smart black hatters are now far more visible and higher ranked than ever and Google doesn’t seem to know what to do to stop them. It’s frustrating to me that after months of hard work repairing my SEO footprint (after purposely destroying my SERPs – read here) I’m being leapfrogged in the rankings by domains that are 2 days old, have little to no content, are missing a quality backlink profile, and are obviously manipulated to appear there. This should not happen, but it does. I’m aware that Google is active in pursuing such exploits and that one day the search rankings may have a high level of purity, but for now I see more poison than ever. Remember the payday loans fiasco? Things haven’t really moved on much at all. Recently a long term client of mine decided that it was just too much hard work to keep his SEO campaigns running. Like me, he was disillusioned somewhat with the results he was getting and decided to focus his attention on real life engagement rather than online. He was essentially going to abandon his website. I was disappointed slightly in his decision, but understood where he was coming from completely. I left our meeting feeling as though I’d let him down with my support. I provided white hat advice that I considered high quality, but it just wasn’t working for him in a field that was highly competitive and had its fair share of black hatters. On the journey home an opportunity started to materialise, in theory at least. One client, one abandoned website, plenty of tools available to measure results – you can probably see where I was going. This was the SEO “perfect storm”, an incredible opportunity to really test black hat SEO that doesn’t come along very often. For reference, the client was previously getting a mixed bag of results from white hat SEO. He ranked on page one for a fairly competitive search term (three words), but on page twenty or higher for his highly competitive two word key phrase that he was really pushing for. At times he didn’t even rank at all in the first 50 pages. Obviously this is not good enough. The first step was obviously to contact my client and ask for his approval, explaining the ins and outs, the pros and cons of doing this. What I didn’t want was my work to affect his offline dealings, but he didn’t seem to mind at all. He was moving in a completely different direction anyway and the search terms that we’d been working so hard on were no longer of any relevance. It was my intention to purchase a completely new, keyword-based domain for these tests, but it turned out I didn’t have to. The client had an existing keyword related domain that was perfect for these tests and it was sitting there dormant. No 301 redirect, parking or anything. No backlink profile, just a four year old domain that was clean and unused. Perfect. I was actually helping that the domain age might help, but there was another side of me that wanted to try these things on a domain that was brand spanking new. C’est la vie. At this point I simply moved the old website to the new domain and set up a 301 redirect with wildcards. Nothing particularly abnormal there, but what I subsequently found was slightly surprising. After approximately one week, the client started to rank much higher for his two word key phrase. He was inside the top 100 results and I hadn’t done anything other than move the domain. Was it the keywords in the domain that changed things or is something else the cause of the improvement? Read on. I’d already previously linked the client’s old website to his Youtube account for him, so the next step was a simple second/third tier link bomb test. I uploaded a video, optimised the title and description accordingly and then started purchasing views, backlinks, likes and comments for that video. 24,000 to be exact, over the course of a month to appear as natural as possible. I didn’t see that figure as too much, and spreading the social share out over one month wouldn’t flag the activity too much. The result of this action (and I also did similar on other high PR websites) was another jump in the rankings. We’ve now hit the top 40 results. Impressive! One thing I will note is that if you intend doing such terrible black hat things for a client using Google’s services, please ensure that you turn off email notifications on your account first. I had one very confused client on the phone soon after I started – one that was getting thousands of emails telling him that people were engaging with his Youtube content. My bad. Next up was an even greater number of direct incoming links to the original site, all spun to a crazy degree to avoid detection, as pretty much as dirty as you can get. I was sure this was an action that would get flagged and destroy the page 3 ranking I had achieved, but went ahead anyway. For this I created 340,000+ backlinks, pinged as a trickle over the course of 30 days. Then I sat back and watched. And watched some more. I was just waiting for the site to disappear in the rankings and a plethora of Webmaster Tools messages to hit me hard. But it didn’t come. The site ranked higher, and then higher, and three weeks later it was sitting at #5 on Google out of 350 million pages. Job done. Whilst ranking on page one for a competitive search term is pretty sensational for such dirty and underhand tactics, there were still four sites above my client’s, so I started doing some research on each of them. What I found was that the first two had very natural organic backlink profiles (wikipedia being one of them), but the third… oh my. The site ranking #3 had a domain that was just three weeks old and drew on the combined power of backlinks coming from a whopping NINE domains. Yes, NINE. Looking up the registrar I could see that the owner also had corresponding .net, .co.uk, and .co domains so I investigated the backlink profiles of these too. It was like opening up pandoras box of nastiness. These three domains had a combined total of 730,000 incoming links, and I couldn’t identify hardly anything that didn’t amount to spam. How dare this person beat me at my own game? Should I intensify the number of links to my client’s original domain or perhaps we could use another tactic? In the past few months I’ve noticed a real problem with Google’s clustering system. Clustering is where Google identifies content that is either duplicate or very similar and groups them all together in the SERPs – effectively serving the user the best version of the duplicate content. Ever wonder why the SERPs can change at times via a single page refresh? Clustering is one of the main reasons why. With this in mind, I decided to take the content of the polluted black hat site ranking above me and copy it word for word on my client’s site. Not just a page of my competition, but every single page in one long Wiki style entry. A total of 6,800 words that I hadn’t originally written and an entire website combined and copied into one page. To add a little spice I added the key phrase and a little extra optimisation to the page title which were areas that the competition seemed to forget, or cared little about. I’ll admit at this point I was a little dubious about this technique, and wondered if Google would pick up on it and generate some hefty penalty. Again, it didn’t come. What did come was what I had hoped wouldn’t happen. After just four days my client’s competition had disappeared from the SERPs, and who was sitting proudly in their place? Yup, my client’s site. It wasn’t always like this however. Sometimes it was back again, and sometimes my client’s site disappeared entirely – it only returned after repeated refreshes. I really didn’t enjoy utilising black hat SEO, even for the purpose of measuring results, so once I’d proved what I set out to it was time to reverse the damage. To clean up I terminated the hosting accounts involved and started providing details of everything I had done to Google. Effectively I reported myself as a spammer. I gave details of where I purchased the backlinks, listed every single one of the incoming links individually, and I also reported any sites I had come across along the way that it appeared had utilised similar techniques. A few days later my client’s site is no longer occupying a spot in the SERPs that should be taken by a high quality site with a natural and authentic backlink profile, but their competition with a SEO footprint that’s almost entirely polluted has returned. Go figure. I’ll also point out at this time that there were a few additional black hat techniques utilised on the way, but they’re newer, lesser known and speculative at best until measured over time (they come from certain forums I shall not publicise and I don’t want to point them out or give them further attention). All I can tell you is that Google is probably aware of them – at least I attempted to make them aware. In all honesty there actually seems little point in a meaningful conclusion here. It’s all documented above in black and white. What I achieved was what I had really hoped was not possible. Black hat techniques working to not only rank highly, but also to destroy your competition’s rankings too. Effectively killing two birds with one stone. This just should not be achievable with today’s Google, yet it’s simple, effective, and it doesn’t take long at all to get the results you want. Are these things going to be addressed? Only time will tell. One thing is for sure however, and it is that Google has a lot of work to do to restore parity in the coming year. If not, you’ll see more and more SEOs turning to the “dark side” and this spells a bleak future for Google, its search operations, and anyone in the SEO industry that wants to do things the right way. Tracy Fensome liked this on Facebook. Jerry Emeka Okorie liked this on Facebook.